It's been a long while since our Portland trip (and we have an impending vacation soon too out of state!) so this post comes a little late to the game BUT it's not because I didn't want to write it. It's because I wanted to make sure that I was in the right state of mind and could give the respect that this restaurant is due based on our meal there. 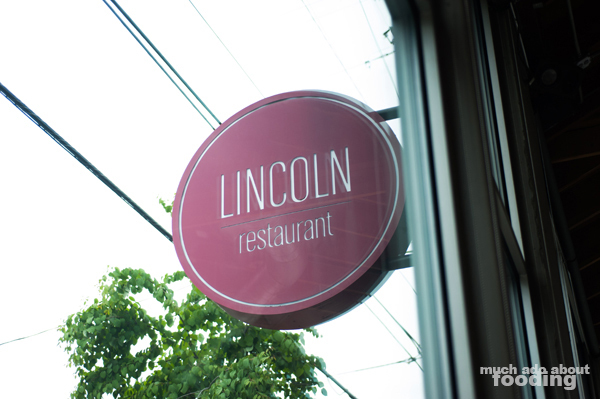 Lincoln Restaurant is one of the restaurants by Chef Jenn Louis whom we first met and chatted with at the 2013 Taste of the Nation event in Laguna Beach. Named one of Food & Wine's 2012 Best New Chefs and a semifinalist for both the 2010 and 2011 James Beard Foundation’s “Best Chef Northwest” awards, Chef Jenn is impressive but never gives the inkling of being so important in the culinary world when you meet her. 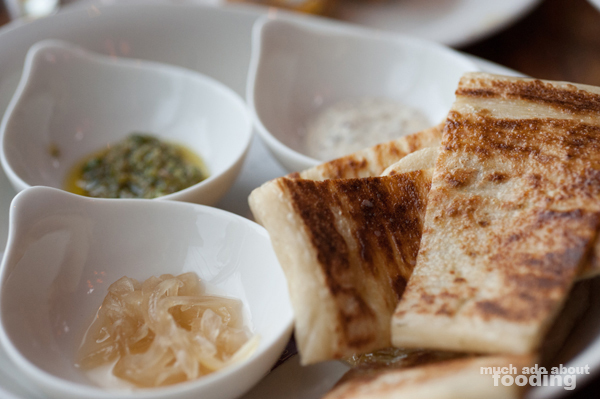 We never got that sense when we dropped by the restaurant during our Portland trip but were ever so eager to check out the menu and dive into all that we had been drooling over in the year that we'd been following her on social media. There was no disappointment that evening - just a glorious, memorable meal. 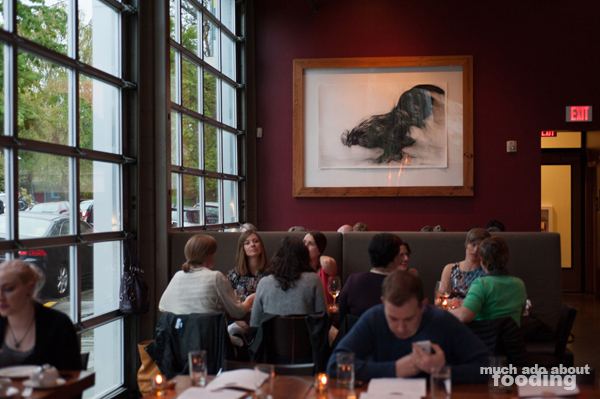 The menu was built like many of the great restaurants in the area by pridefully using locally-grown Pacific Northwest ingredients and focusing on only what is in season. I didn't realize until after I had read more about Lincoln online that it was listed as one of Condé Nast Traveler’s “Hot List” of 50 top new restaurants in North America shortly after its opening. 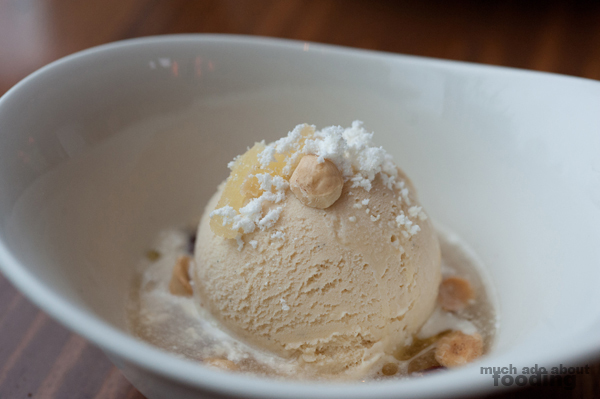 I realize that because of its focus on seasonal menus and the ever-changing experimental dishes that the chef puts out, these dishes pictured below might not be spotted anytime soon on your own menus but they should give a comprehensive look into the types of dishes and creativity one should expect at the restaurant. 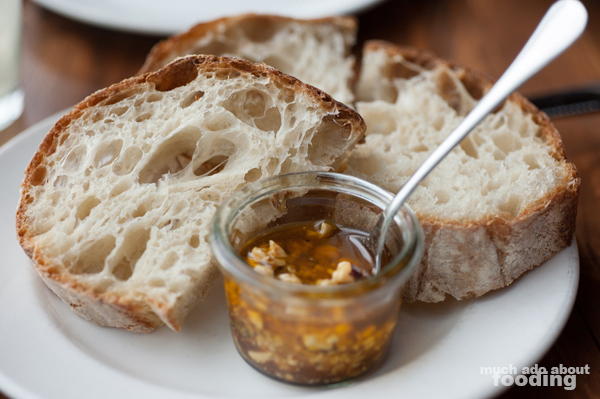 To start, some of their bread which came with chile hazelnut honey olive oil. Warm, fluffy, and with an audibly crunchy crust, this bread needed no supplement but we could not deny the spicy and sweet drizzle of their unique oil. To whet our appetite, we ordered three of Lincoln's starters and side to share. 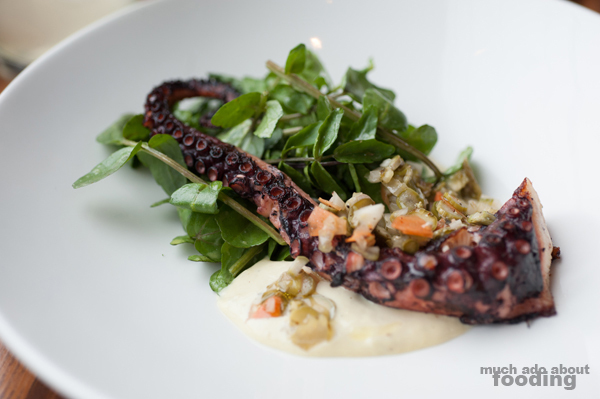 The first was the Grilled Octopus ($13 - with tonnato sauce and giardiniera), one elegant plum-colored tentacle with a slight char for character. The meat was tender and juicy, unlike the rubbery texture that some mistakenly bring the mollusk to. It hardly needed the accompaniments it was with but those just blended the flavors together even more so. 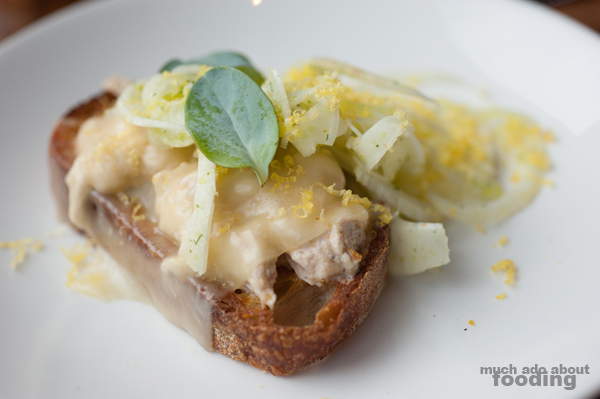 Our next order out was their special for the day so I do not have a price point to note; it was the Rabbit Rillettes Crostini (with shaved fennel and oyster leaves). Easily, the bread portion impressed but then we got into the creamy, smooth rillettes that coated the top of your mouth with each bite in its fatty treasure. I never knew such a thing as oyster leaves existed but it gets its namesake for its distinct taste - it absolutely tasted like a fresh, briny oyster! These topped the creaminess with some natural saltiness, striking a point where the protein's heaviness could not overtake the bites. 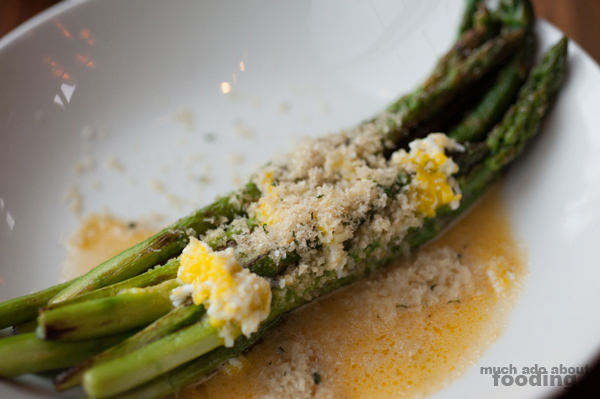 Lastly was the side of Asparagus ($7 - preserved tomatoes, sieved egg, breadcrumbs) which was simple yet executed well. The stalks held their vegetal crunch but were cooked through, and the breadcrumbs contributed a fun texture to every bite. We were extremely eager to see how our entrees would turn out after such a beautiful beginning to the meal. 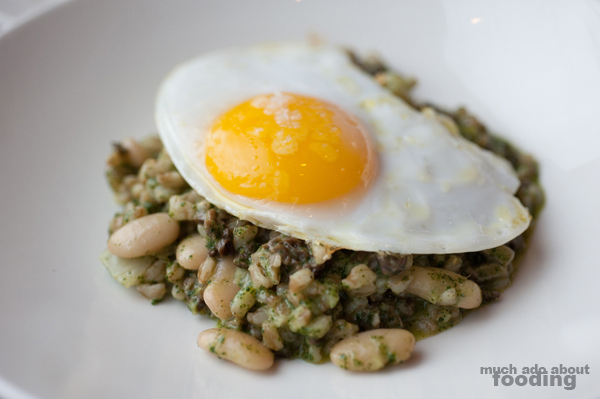 Duc ordered Lincoln's Farrotto ($18- with false morel mushrooms, tarbais beans, wild nettles, and duck egg) and I the Corned Lamb Neck ($28 - with calcot onions, mint salsa verde and onion agrodolce for pita) because I had never seen such a dish before. The moment the farrotto came out of the kitchen, I knew our entrees were coming because I could smell the mushrooms from afar. They were almost smoky in scent and most definitely mushrooms. There was an abundant amount of them in the dish, and the gleam of the large duck egg was nearly promiscuous. Duc quickly broke the yolk all over the farrotto which didn't even need the liquid gold to be creamy - it was already so itself. I think his only complaint was that the serving size was too small for how delicious it was. I, on the other hand, struggled with the sheer size of my lamb neck. 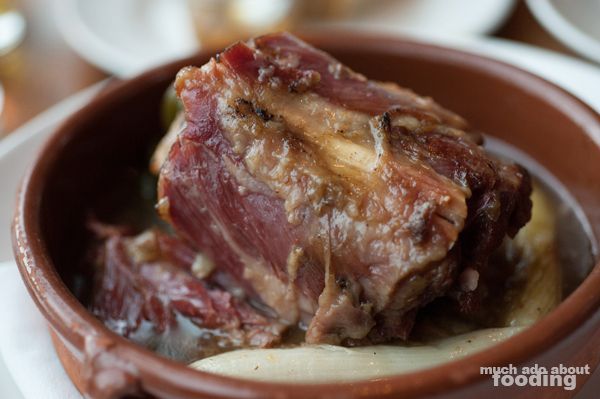 As a fan of corned beef, I had been curious about what a corned lamb neck would be like but did not expect for the full bone to come out as well. Served in a cassoule, the rich and sumptuous neck was intimidating. The animal itself must have been well cared for considering how meaty the whole piece was. I loved the concept but may have fared better had the dish not been so big; after a while, the saltiness started to intrude on the experience. To steel one's self against that happening, you can partake in the warm and pliant pita pieces with their own accompaniments. Each one brought a different flavor profile to the meal when paired with the neck from sweet to spicy to slightly sour. Eventually I did throw in the towel on it but only after nearly 90% had been finished. Despite our stomachs protesting any more torturous filling, we decided we had to have dessert too since everything else had been fantastic. 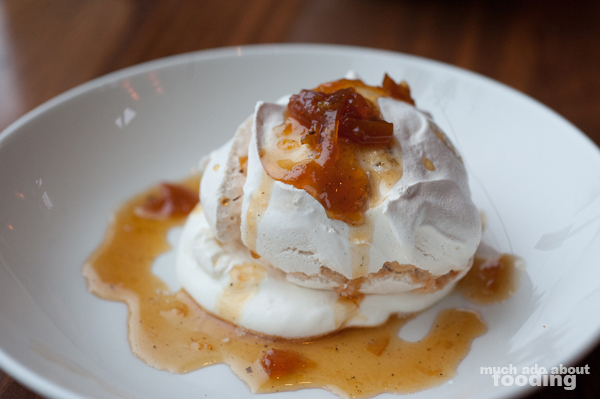 We started with the Brutta ma buoni ($8 - creme fraiche and citrus conserva), an Italian dessert which translates to "ugly but good" because it is not the most presentable of dishes but still tasty. It certainly was though, especially with the tart but sweet conserva. We also partook in the Rhubarb Ice Cream Float ($8 - sweet wine, hazelnut oil, and ginger) which swam so generously in the wine that we smelled the alcohol before seeing it. The ice cream was luscious but was practically overpowered by the wine. It's certainly a dessert fitting for one who isn't as full as we were! Overall, an amazing meal with an amazing chef and staff. 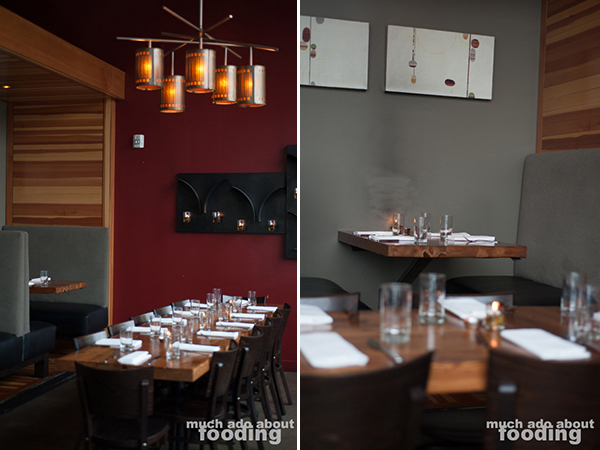 The restaurant itself is not a casual walk-in spot but we didn't feel like anyone was pretentious or condescending. I think it's one of the things we liked about wherever we went in Portland!